Just to set your mind at rest, I am not in anyway associated with any of the brands that I review and my reviews are impartial and 100% honest. Unlike a lot of reviews out there that say something is great only to discover that the reviewer is sponsored by said brand. 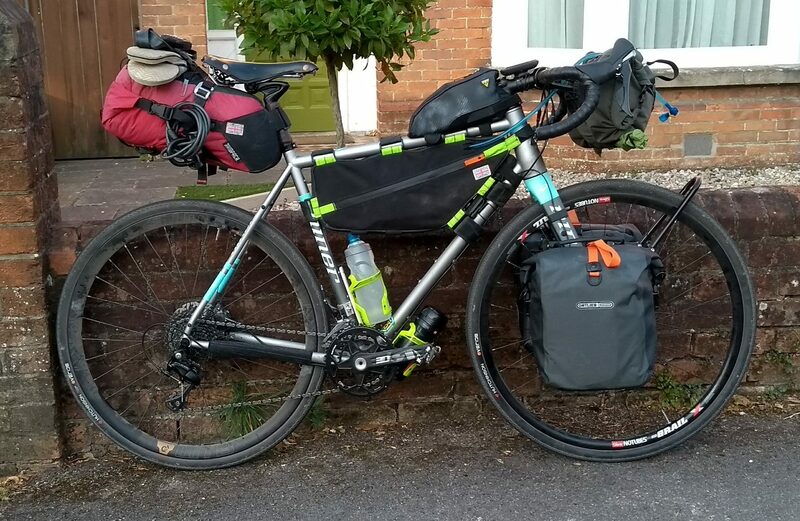 This review is about my latest touring bike which is based around the Niner RLT 9 Steel frame and fork. Now when I purchased this frame and fork I was a little hesitant as all of the reviews I had read left me feeling as if they were biased on the basis of some underlying reviewer / Niner association. So I was not totally sure whether it would live up to expectation. Well, in a nutshell I love this setup and the frame and forks work really well. I was concerned that the carbon forks loaded up with low rider panniers stuffed full of clothing, cooking equipment and food would feel flexy, like the specialized diverge carbon forks did. But the reality is that they didn’t feel flexy at all and were nice and stiff. There were 2 small gripes that I had and I am going to contact Niner about this. the front axle is a 15mm QR one and I found it fouled the lower plastic of the pannier. An allen key axle would be a much better option. They provide this as standard on their Niner RDO fork (I have them too). Scrap the push fit BB. Manufacturers know, we the consumer hate them and they are crap. A steel frame should have a threaded BB. Apart from that though, I would not hesitate to recommend this setup for bike touring trips. Whilst I used it for 2 weeks through France, I would happily take this bike on an extended touring trip which took in both tarmac and gravel sections and I actually can’t wait to use it again. Full details are a follows. Rear Wheel : 32 hole WTB Ci24 carbon rim laced to DT Swiss 240 with DT Swiss Comp spokes. Drive Chain : Rotor 3D30 with direct mount 46/30 rings and rear SRAM 11-36 cassette. This provided low enough ratio so that when climbing 15% climbs with bike fully loaded I was able to maintain a high cadence and therefore not put undue stress on the knees. A standard compact chainset with a 11/32 rear cassette does not provide low enough ratios for steep climbs. Framebag : Homemade and designed to hold a 3 litre camelbak bladder. Worked really well. SeatPack : Bought from Bikepack.pl and has been used for Divide ride, Tour Aotearoa and France. Would recommend. Handlebar Cradle : Salsa EXP Anything Cradle. Worked really well and I carried my tent and sleeping mat with this. Much prefer this to a standard harness as it doesn’t interfere with your brake / gear cables whilst still enabling you to get your hands around the top of the bars. The packs that strap to the underside of the bars restrict you from wrapping your hands around the top of the bars and you have to ride with your palms flat on the top of the bars..